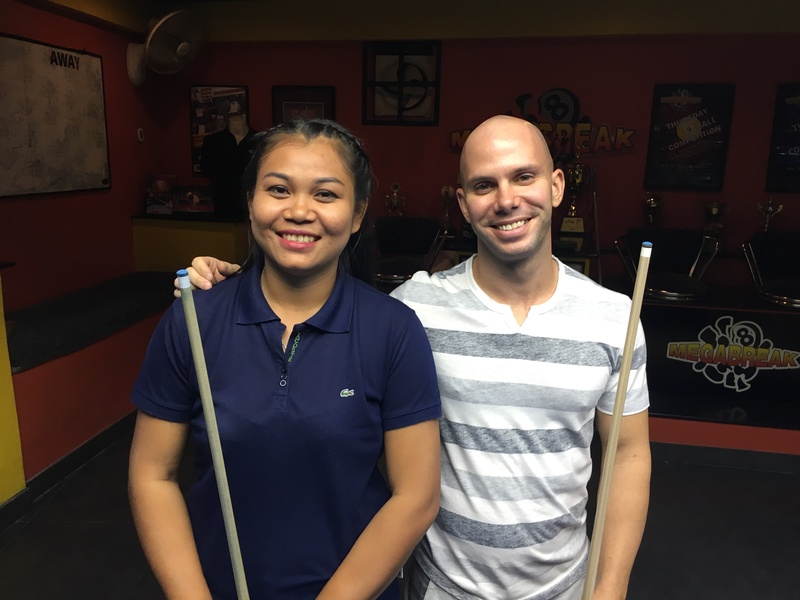 THURSDAY 9 BALL GRAND FINAL : RUSSELL IS CHAMPION. Russell Masciotti from The USA is our Thursday 9 Ball Grand Final Champion for Season 18. He was in great form on Saturday to stay undefeated all night long and take home the 1st Prize of 10000 baht. 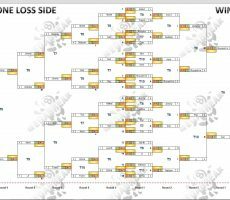 From the maximum entry of 16 players, he defeated Thailand’s Aom Nantaporn Chomthaisong in the deciding rack of the final by 6 racks to 3 (race 6-4). Aom looked set to take the final to a second and deciding set with the score at 3-3, but Russell dug deep to win the last three racks and lift the trophy. Consolation for Aom, who continued her recent run of good form, was collecting 6000 baht as Runner-Up. Par Radardow Inamka was next, playing well to finish in 3rd Place and receive 4000 baht. Her handicap is also increased to A+4. 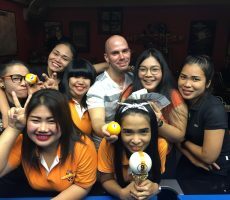 Thursday regular Jimmy Schmitt from Germany was in 4th Place taking home 3000 baht. The Top 8 players all made a profit on the evening. Winner : Russell (A+5) – 10000 baht. Runner-Up : Aom (A+3) – 6000 baht. 3rd Place : Par (A+3) – 4000 baht. 4th Place : Jimmy (A+4) – 3000 baht. 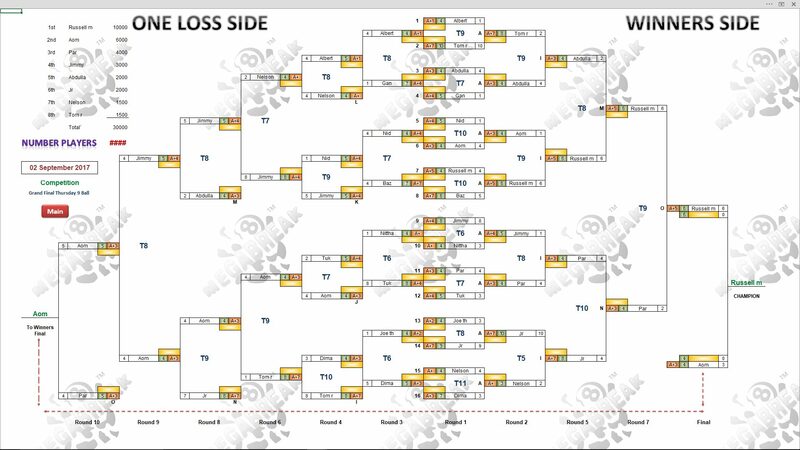 Equal 5th Place : Abdulla (A+3) and Jay-r (A+7) – 2000 baht each. Equal 7th Place : Tom Rooney (A+7) and Nelson (A+) – 1500 baht each. The Calcutta Auction created an extra Prize Pool of 11800 baht and was won by Abdulla from Qatar. 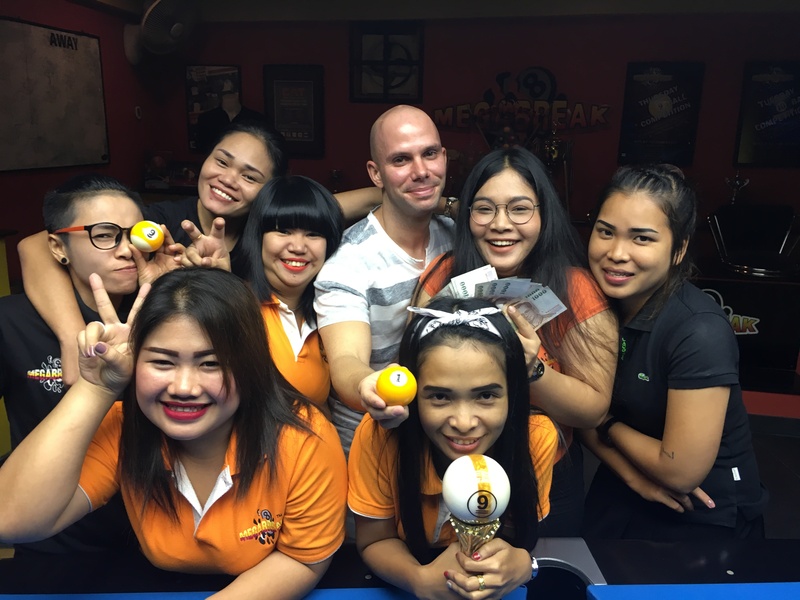 He bought Russell for 800 baht and took home the 1st Payout of 4800. 1st (40%) : Abdulla (Russell) – 4800 baht. 2nd (30%) : Jr (Aom) – 3500 baht. 3rd (20%) : Jr (Par) – 2300 baht. 4th (10%) : Jr (Jimmy) – 1200 baht.